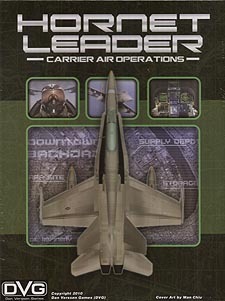 Hornet Leader places you in command of a US Navy or Marine strike fighter squadron in a modern air campaign. Each pilot under your command has individual skills, and each aircraft has individual ratings. You select the best mix of pilots, aircraft, and munitions for each mission. Even with the best air craft and weapons ever developed for aerial warfare, it still requires your command skill to win the war. Libya 1984, North Atlantic WWIII 1986, Iraq 1991, Israeli Defence 2001, Syria 2004, Taiwan Defence 2008, North Korea 2011, and Iran 2014. F/A-18C Hornets, F/A-18E and F/A-18F Super Hornets, EA-18C Growlers, F-14 Tomcats, A-6 Intruders, A-7 Corsair IIs, EA-6B Prowlers, E-2C Hawkeyes, AV-8B Harrier IIs, F-35B/C Lightning IIs! Hornet Leader is a Solitaire Game. You command jet fighters and make historically accurate decisions while the built-in game system generates the missions and controls the opposing forces. This means you can play the game at your own pace, whenever, and wherever, you choose.